When I was young, I was always excited to visit my grandparents in Chicago. They never had a car so we walked to the grocery store and took the bus or train downtown. Along the way, we would stop and talk to the neighbors, explore new place, and water the community garden or bring dinner to a sick friend. I soon realized that those journeys were possible because of how the environment was built. I chose to become a landscape architect to make communities more vibrant places to live life, more like the experiences I had in my grandparent's neighborhood. This, mixed with my love for all things active, drives me to provide opportunities for others to experience the joy I feel working, playing, traveling, walking, and bicycling in my community. Beth Flanagan is a registered landscape architect whose technical background, enthusiasm for connecting people, and writing abilities brings a unique set of skills to the marketing department at Alta. 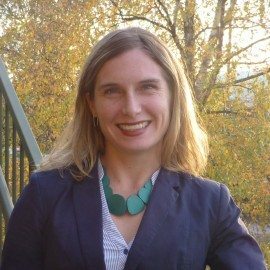 She has been deeply involved with the sustainable community in Portland for many years volunteering with 1000 Friends of Oregon, Cascadia Green Building, the American Society of Landscape Architects, and BikeWalkVote. When not at work, Beth can be found riding bikes all over creation, climbing mountains, lacing up her ballet shoes for class or exploring the world’s many cultures and landscapes.